If you are someone from U.S. or Canada who travel from one country to another, you might have definitely experienced difficulty in communicating with the number that you have been using. If there are chances for you to communicate using your same phone number to anywhere in the world, then you would be greatly thankful. Where am I going? Will I be able to call my family? How am I going to call mom/wife back home? These are the many questions that come to your mind on board abroad. While social network plays a major role in making sure everyone knows about your whereabouts, sometimes it’s nice to make a call with friends and family across the globe. One app that might relieve you from this troublesome situation is NomadPhone. This utility app in the App Store is a month-to-month subscription. The app allows you to send/make countless texts and calls and gives you a local number that works all over the globe. The app assists you by providing a reliable mobile number that can be used across borders and with different sim cards. No matter wherever you are, with NomadPhone you can reach others with a domestic phone number. If you have missed any calls or texts when you were offline, the app notifies you via WiFi or data. NomadPhone has many beneficial features like eliminating roaming fees, reducing your phone bills, unlimited messaging, voice mail of text etc., This new innovative app made by NomadPhone LLC, allows you to get a new number in minutes. The app gives you an outgoing caller ID that makes it look like you are calling from your office while you are actually out of the country. The app routes your calls to the NomadPhone app and there are no chances that you miss a call. The app is so simple and is ad-free and you will not be charged for using this app. 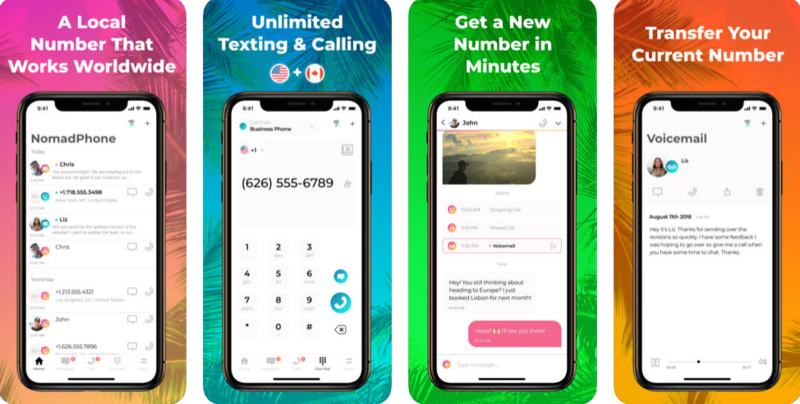 The app comes with many subscription options like an active phone number with all premium features for $9.99 and number porting with a one-time fee of $12.99 with a 14-day free trial. NomadPhone is only available on the App Store for iOS devices. It requires iOS 8.0 or later versions and is compatible iPhone, iPad and iPod touch. The app is available for a free trial of 7 days. Need to talk with your business peers, friends or family or clients during your travel abroad? No more worries. NomadPhone is there for your rescue.